There will be seven flavors to start: vanilla, chocolate, coffee, mint chip, cookies & cream, lemon cookie, and cardamom. Each pint packs 24 grams of protein. They seemed inspired by the regular three twins lineup and that should be a good thing. The slim twin webpage doesn't have nutrition info posted yet, but the PR person told me that it's "cane sugar, monk fruit, and small amounts of erythritol". I had hoped for something without erythritol but I guess I am out of luck. At the moment it looks like it's going to start off as a west coast thing, but I felt it was important for everyone to see just how quickly things can change. To put that in question form: who do you think will jump on the bandwagon next? could we see weight watchers or healthy choice take the plunge? Haagen-Daz? Turkey Hill? Take a guess and leave it in the comments. Parting thoughts: 1) I'm trying to get Nick to actually review a pint of Breyers Delights. 2) I apologize that my posting is still inconsistent since I was sick. I guess I'm using the slowness of the freezer aisle as an excuse to take better care of myself. In the past, I would force myself to post no matter what but recently I'm letting my self slide with a movie or early bedtime. Gotta recharge before ice cream 2018 starts. New review will be up on Monday. UPDATE: I forgot to go back and check ingredients. So much for "small amounts of erythritol". Slim Twin Vanilla = organic nonfat milk, organic egg yolk, organic milk protein concentrate, organic erythritol, organic soluble tapioca fiber, organic cream, organic vanilla extract, organic cane sugar, organic locust bean gum, organic monk fruit extract. Granted I don't know the flavor to quantity ratio, but that order of ingredients does not match how it was described. That really annoys me since they were annoyed when I pointed out the erythritol... yet here we are and what's the fourth ingredient? erythritol. Definitely take care of yourself first! Always love the reviews, but you deserve rest and self care just like the rest of us. I have yet to try one of these "healthy" ice creams, but I bet we see more store brands jump on the trend. Seems like something Trader Joe's or Stop and Shop might try. That would be funny to see Trader Joe's throw out one of these next year! Your reviews are worth waiting for! You should always take some time for yourself, but especially when you’re sick. I’m a huge believer that not getting enough sleep makes everything worse...so get some rest! We will all still be here when you’re back to 100%. I guess when Halo Top becomes the best selling pint in the US others want a piece of the market share (believe it or not, it's true). As a frequent consumer of super light ice cream, I will say everybody has at least one flavor that they do best. For me, it's breyer's light cookies and cream, Halo Top's candy bar, and Enlighten's chocolate pb and/or cookie dough. @Anon#1: so easy to skip some sleep and I know I shouldn't! @Anon#2: That was genius marketing on Halo Top's part in getting that press release out. Basically they took a four week window and said there total gross was more than the other brands. In other words, 5 pints of $3 B&J's would equal 3 pints of $5 halo top. I was confused as to why no one called them out on this (I think there may have been one other catch in their analysis as well but I can't think of it offhand). I'm not saying Halo Top isn't doing well, but always be careful about how people word things. I use these kind of ice creams as a calcium supplement--my endocrinologist told me that calcium in dairy is much better absorbed than other food sources(like kale) and from pills. I hate yogurt and don't care much for milk if it isn't in cereal--enlightened has the most that i've seen so i generally have those-it's like 2 glasses of milk! i can't find the nutrition panel on these though to check it out. Yeah, I think the website isn't 100% finished yet but hopefully it will be up soon and you can check it out. Hello, this is Neal, the founder of Three Twins. I appreciate the coverage. I decided to create Slim Twin as an evolution of the better-for-you category. It could be viewed as a "me too" brand but I really think that we are evolving the category by offering the first certified organic option in the better-for-you category and offering a cleaner ingredient statement than Halo (no bitter stevia, no added salt and no glycerin). I also think that it's the best tasting offering in the category, but I am biased. As a bonus, it's also scoopable and we give back through 1% For The Planet. Unlike Halo, Arctic Zero and Enlighten, we make our own product at our own factory. 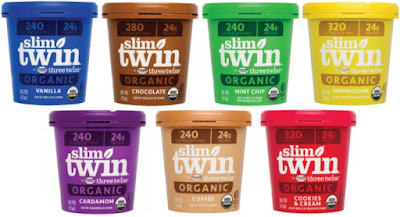 Slim Twin will start appearing in stores nationwide in January, including Whole Foods in all regions. You may see it in some stores before then. I am happy to send product or free product coupons to facilitate your review. Hello Neal! Long time no talk! I tweaked the review so it's a little more clear that when I was talking about being like the others, I was referring to the erythritol and not the overall ingredient list. Sorry if that was a bit confusing before. Feel free to contact me at second scoop at gmail dot com and we'll work something out, possibly with Nick doing the review since I have trouble with sugar replacements. As much as I'd love to see Haagen Dazs be the next brand to jump on the bandwagon I feel like it will probably be Ben & Jerry's since they were one of the first to jump on the dairy free/vegan bandwagon. I think Haagen Dazs could do it better, but really I'd just be happy with more options period. My favorites will likely remain Enlightened and then Halo Top (Enlightened is slightly better since it's creamier, more dense, filling, and has more mix-ins, but respect goes out to Halo Top for being the original and continuously releasing new flavors). Honestly Breyer's Delights were pathetic and disgusting; it's their cheap frozen dairy dessert "ice cream" made slightly worse while costing a lot more. The cookies & cream Breyer's Delights is their closest one to making it, but their new Butter Pecan is especially a complete failure (it's bright orange and doesn't even taste like butter pecan)! Hopefully Three Twins will do it better, I just wish they came out with more original or unique flavors. My entire bank account goes out to the first brand to release a cotton candy flavored light ice cream pint ;P I'm addicted to the Cotton Candy ice cream by Cold Stone Creamery (and the "Partly Cloudy" flavor by A La Mode). I’m actually super in to all these different companies making these low cal/high protein “healthy” ice creams! Even some stores have their own brand of it—Kroger’s has “Low Cow” Which I’ve had 3 pints of and despite the freezer burn (my fault—tried to do some other errands after picking the pints up on a too hot day) they were totally comparable to Halo Top for much cheaper. I did also try Breyers Delights C&C and for what it was I didn’t find it bad at all—better than Halo C&C which isn’t saying much. I like when these companies making these healthy ice creams try to include at least one new/unusual flavor in their starting lineup. Here I’m totally intrigued at cardamom?! Not sure it will work but will try and see if I can find it!! I’m not interested in plain vanilla or chocolate pints of these ice creams—just can’t be bothered. So props to them for something different! I'm hoping Turkey Hill will jump on the low calorie bandwagon to see which flavors they would come up with. Their flavors with swirls would be unbeatable. Now that there's so much competition with low calorie ice cream I'm surprised that Arctic Zero hasn't went out of business. That ice cream if you can even call it that is seriously the worst out of the other contenders. Breyers is a close second with how mediocre their bases are. I'll definitely give Three Twins a chance depending on if any local stores get it in. Yes low carb w 10 grams protein or less for those that are low carb med protein..